LN16ORV MERCEDES-BENZ C CLASS 1.6 C200 D AMG LINE PREMIUM 4d AUTO 136 BHP- 56K miles- Full Mercedes Service History- 1 Owner The Mercedes C class looks absolutely stunning in grey and offers a brilliant specification of 18" diamond cut alloy wheels, Front and rear park sensors with reversing camera, LED high performance headlights, electric folding mirrors, Electric glass sunroof, Full Leather interior with heated front seats and memory drivers seat, Multifunction steering wheel, Cruise control and speed limiter, Sat Nav, Voice command, Dynamic driving modes, Bluetooth, DAB Radio, FM Radio, CD and USB, Electric windows and remote central locking . Supplied with 2 keys ! Everything you would expect from a Mercedes and a bit more ! 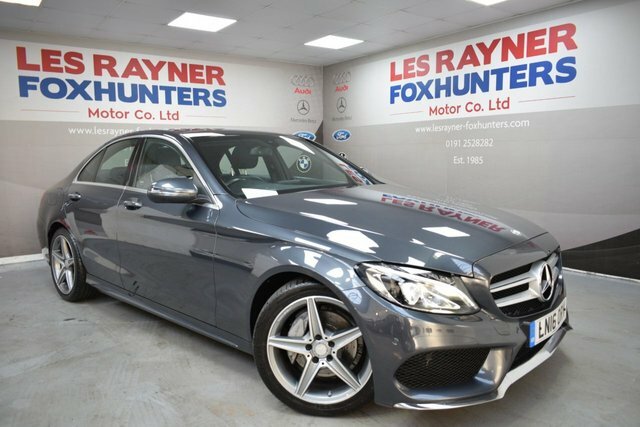 The 1.6 Diesel automatic is a very smooth driver which returns amazing MPG ! Low Tax ! This car is must be viewed , a credit to its former keeper ! 12 months tax	£30.00 MPG Extra	74.3 MPG Combined	64.2 MPG Urban	53.3 TO VIEW ALL OUR STOCK VISIT www.lesrayner-foxhunters.co.uk We are a family run business that has been established since 1982.All of our cars are HPI clear and come with a 12 month MOT, Full Service and Pre Delivery Inspection so you can buy with confidence. Personalised Videos and Facetime available! LOW RATE FINANCE! BESPOKE HIRE PURCHASE, PCP & LEASE PURCHASE PACKAGES! PART EX WELCOME! NO SALES ADMIN FEE!